Well, my boy had surgery! I took him to Athens, GA on Monday, April 10th for his consultation. They went over the procedure and all that good stuff. He was to have a CT scan that afternoon to get a better look at the ear canal and make sure that there was nothing else going on in the ear. I kissed my boy goodbye and headed back home. On Monday evening, the vet called to say the scan looked clear other than the mass in his canal...which was fantastic news. He would go into surgery the next afternoon. Tuesday - They called in the morning to say he did good overnight and was fasting to prepare for surgery. Apparently, he was a bit grumpy and didn't like being in a kennel, so he was being vocal...so that got him a few extra walks! LOL They called again when he was taken back and my nerves went crazy. We waited, and waited, and waited some more to hear how it all went. Happily, they got the ear canal out and surgery went perfectly. He was resting for the night in ICU. Wednesday - My morning call said that he had gotten sick over night, most likely due to the pain medicine. They would keep and eye on that. Also, his left eye (the side the surgery was done) was not blinking. They were keeping it lubricated. We knew this was a possible side effect that his nerve could be damaged. So, we would just wait and see what happened. That night's update confirmed the same that his eye wasn't blinking and he had thrown up again. Rough day for my boy. Expected he would go home Friday. Here he is coming in to see us! He was a sleeeeepy boy on the way home. We got home about 8pm that night and had Sarge & Stella meet T-Bone through the fence. Knowing they would all be excited, we didn't want them to bump his ear. Stella was all wiggles...which was a huge surprise. Sarge didn't seem to care either way that his brother was home. We kept them separated for the most part, unless I was right there. 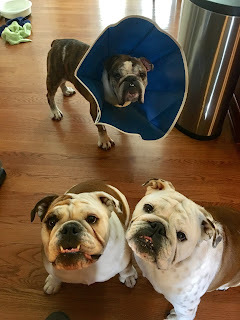 Poor T had to keep the cone of shame on all the time. He was so cute though, it just made me laugh. Helping me do my vest! So sweet! Because we are mean, and Sarge was so nosey with the cone, we thought we would let him try it on! So, all is well in our household and life is back to normal. It was so weird not having T-Bone at home those few days. I felt like a part of me was missing! I'm happy to be whole again! Unfortunately, T still hasn't grown his hair back, so he will be funny looking half-shaved for a while! He's a bit itchy due to not being able to get his medicated baths, so we have some work to get his skin back to good.